Our people’s quest for freedom and democracy goes a long way back. We have paid a huge price in order to be able to live on this land, with freedom and dignity. The struggle for freedom and democracy, against foreign invasion and against oppression, began in 1919. We rose up in 1919 to break the shackles on our feet. I commemorate with God’s grace all our martyrs, who sacrificed their lives for the sake of our freedom and independence. Through their sacrifice, Turkey has achieved both her freedom and her independence. Through the blood of the children of this land, Turkey has become a free and dignified country. After the War of Independence, we founded our Republic. It has not been easy for the nation to gain sovereignty. This has not been vouchsafed to us. We gained it ourselves, with blood, tears and sacrifice. We stated that “Sovereignty rests unconditionally with the nation”. And we carried out what was required by this principle. We said that whatever constitutes modern civilization shall be present in Turkey’s way of life as well. We turned the people into the fulcrum of political life in Turkey. We have recognized universal suffrage. We renewed the Civil Code. We made reforms in all areas ranging from business life to the Penal Code. Regarding women’s rights, we took steps that were far ahead even of many European countries of the time. We endeavored for our people to benefit from contemporary rights and freedoms, with an understanding that viewed the individual as its centerpiece. All of these steps were great breakthroughs that had never before been achieved. Even after 90 years since these reforms, we still witness the lamentable troubles that Middle Eastern are facing, having failed to take similar steps. Because we have taken these steps, we have been the model country in this region for 90 years, and we should continue to serve as a model. I want to commemorate with respect, with gratitude and with God’s grace, Mustafa Kemal Atatürk and all his friends, who have realized these revolutionary reforms, side by side with our nation. They overcame all obstacles without ever falling into despondency; and they established a brand new, enlightened state with the goal of modern civilization in its horizon. Out of a “sick man”, they have built a young country. They transformed a people who had thus far been regarded as vassals into a nation. They did not consent to anyone in this country being treated as a second class citizen. In the year 1946 we made another breakthrough. Joining hands with our people. We paved the way for a multi-party political system. We introduced free elections. We ensured that the people choose their executives through their own free will. “This defeat is my greatest victory,” said the late İsmet İnönü after he had lost the elections. Because, with the carrying out of these elections it was Turkey that won. Because it was the essential principles of the Republic that had won. With the multi-party system, our regime was grounded on a sound foundation. The goal that had been expressed at the very beginning was fulfilled, and sovereignty was passed on to the people. Because, they had set started out saying that “Sovereignty rests unconditionally with the nation”. This had been a promise. The promise was delivered. I wish to commemorate İsmet İnönü with gratitude and with God’s grace, who has his signature under this great breakthrough, who has helped us build up a multi-party system. While many never agreed to pass on to the people the power that they possessed, he showed the courage to cede power in favor of the people and of those elected by the people. In this process in the history of Turkey, like a pendulum, anti-democratic practices paced side by side with demands for democracy. But take a careful look at history. The winner has always been democracy, freedom and justice. Our people have always taken a stand in favor of democracy. In the 1970’s we have stood by the side of labor, which is the highest human value. With the social democratic reforms, we have protected the rights of the laborer in the strongest sense. We introduced union rights. We reorganized work life. We recognized right such as the rights to strike and lock-out. In this period, labor was elevated to the level of the highest human value. “This order must change,” we said. “Land belongs to those who fill it, water belongs to those who use it,” we declared. We have admitted the rights of the labour. I wish to remember once more with God’s grace, Bülent Ecevit, who led the way for this great breakthrough. The legend of “Karaoğlan” was born not in newspaper headlines but in the heart of the people, and that was where it grew. We say, “Let the people live, so the state can live”. Now, they were the ones who let the people live, they were the ones who valued the people. These reforms were of a nature so deep-rooted, so powerful that even coups d’état failed to eradicate them. Today we cannot even imagine a Turkey where there is no Republic. Today, we cannot even see in our nightmares a Turkey without a multi-party system. Today, we cannot ever accept Turkey as a country where workers’ rights are not protected. The ship on which modern Turkey has set sail is unfaltering. Its route is definite. This ship shall continue to sail in its chosen direction. Surely, at every period there have been problems in our democracy. Thanks to the strength of our fundamental institutions, we have overcome these problems. Once again, we will overcome these problems on the strength of our institutions. I say loudly and clearly that Turkey’s history of democratization has not started yesterday. This is a 90-year old struggle. Those in Turkey whose hearts beat for the people and for the truth, have paid an enormous price for more democracy, more freedom, and for a modern Turkey. To disregard this cost paid by our people is to overstep the line, whoever it may be. In those 90 years, we have youth who have been tortured in torture chambers. We have Nazım Hikmet, Ahmed Arif, Can Yücel, Sabahattin Ali and so many others who have been put into prison because of their opinions. In this struggle for democracy there we have Ahmet Taner Kışlalı, Muammer Aksoy, Ruhi Su, Uğur Mumcu and many others. We have progressed step by step in this struggle. I want to commemorate with gratitude, once more, all those who have paid a price in this struggle. Where we stand today is unfortunately not a point that Turkey deserves to stand upon. Turkey has lost a lot of time in the last 11 years. The steps that were required for freedom and for democratization were not taken. Unfortunately, in the AKP period, Turkey has gone down and lost ground on all of the democratization benchmarks. For instance, In the annual Human Development Index of the UN, Turkey ranked 85th place in 2002. Today, we rank 90th. Despite the 11 years that we have been left behind, Turkey is still categorized as a “hybrid regime” in the democracy index. According to the Freedom in the World Index, unfortunately, Turkey is still a “partially free” country. In the “Press Freedom” Index prepared each year by Reporters Without Borders, Turkey ranked 99th in 2002. Today Turkey ranks 154th. According to international press organizations, Turkey is the world’s biggest prison for journalists. This is another harsh truth. In the year 2002, there was not even one Member of Parliament who was a detainee. The Grand National Assembly of Turkey has last opened, with 7 of its members in prison. Hundreds of local administrators are still in detention. Whenever there’s an incident that affects you (i.e., Prime Minister Erdoğan), you start talking about the “national will”. Those who have elected you are recognized as the national will, but why don’t you recognize as “the national will” of those who elected these members of parliament and these mayors? In the year 2002, there were 59,000 citizens in Turkish prisons. Today, the number of citizens in prison, including those who are convicted and those under custody, have reached 135,000. According to the recent statement by the Ministry of Justice, a total of 2776 students are held in detention as of 1 October 2013. We have seen children wearing keffiyeh’s put into prison. We have suffered the pain of seeing our children arrested for demanding free education. In the last 10 years, a total of 121 cases of murder by unknown assailants have taken place in Turkey. Unfortunately, the actual murderers of Hrant Dink have still not been found. All of the state employees who shared responsibility in the murder of Hrant Dink were promoted in the ranks of bureaucracy. We have seen these people becoming members of parliament, even ministers. In this period, murders by unknown assailants have been placed under the protection of the state. A total of 152 of our children lost their lives in this period as a result of the disproportionate use of violence by law-enforcement officers. I want to commemorate on this occasion, once more, with God’s grace, Ali İsmail Korkmaz, Ethem Sarısülük, Ahmet Atakan, Mehmet Ayvalıtaş, Medeni Yıldırım and Abdullah Cömert. Once again, I want to commemorate with God’s grace, Mehmet Uytun, an 18-month old, who died as a result of a gas canister striking his head. Since 2003, more than 5,600 cases of torture have been recorded in Turkey. Minor children have been raped in the penal institutions of Pozantı and Şakran. They have undergone torture. MP’s of the Republican People’s Party have pursued these issues. By the force of their work Turkey has realized these harsh truths. I would like to thank these courageous members of parliament. In this period, the judiciary completely lost its independence. A judiciary that is totally subject to the government has been established in Turkey. In the Deniz Feneri lawsuit, which is also labeled the “lawsuit of the century” the accused were protected and looked after. Those who were penalized after all were the honest prosecutors who investigated the fraud. This incident is one that shall be noted in history, illustrating how judicial independence has all but disappeared in Turkey. We will keeping track of this issue. With the Council of Higher Education, pressure over the universities continues the same way as before. The demands for academic autonomy have been put in cold storage. In 11 years, the democracy of Turkey has undergone serious erosion. Our culture of democracy has suffered a devastation comparable to those in the times of military intervention. The essential values of democracy such as social consensus, common sense, shared wisdom have been shelved. Profound divides in society have been nurtured through a politics of otherization and polarization. In Turkey in the last 11 years, a great deficit of democracy has come into being and the Justice and Development Party (AKP) is trying to sell these to the society under the name “advanced democracy”. Now I ask Turkey, I ask my citizens… Will the so-called democratization package which has been announced today be a cure for these troubles? Can this package cover the deficit? This package cannot be a cure for this problem. This package can certainly not cover this deficit. Because they are not sincere about democracy. Besides, in Turkey there is a serious shortfall in government. Turkey unfortunately does not have a government with the democratic maturity that is befitting and that it deserves. Even while this package was being prepared the most basic principles of democracy have been trampled on. This package has been prepared behind closed doors, leaving outside all elements of society and even the members of the Cabinet of Ministers. Mr. Prime Minister has expressed his thanks regarding the package to the Undersecretariat of Public Security, which is a new institution of emergency rule… This expression clearly puts forth with what kind of a mindset the package has been prepared. This package has been prepared without regard for participation, social consensus and transparency. What is shameful is to degrade the term “democracy” by using it in the label of this package. While announcing the package, PM Erdoğan has gone all the way back to May 27, but he made no mention of the coup of September 12… I’m wondering if that’s another way of endorsing the law of that coup d’état? Why is the government not sincere about democracy? Because we have made proposals about many of the points in this package beforehand, and the AKP has rejected them. For instance; We have said that the elections threshold should be lowered. We have told them to eradicate the obstacles before the national will. We have brought legislation proposals to the Grand National Assembly. The AKP has all rejected them. We have asked to lift the ban on the use of languages in politics. We prepared a legislation proposal that would enable conducting politics in other languages and dialects. The AKP has rejected it as well. We have brought a proposal to provide the political parties that have joined the elections with funds from the Treasury, according to their percentage of votes won. Again, AKP has said “no”. We have made a proposal ensuring that prison penalties for hate crimes not be turned into fines. AKP has not accepted this either. We have proposed a brand new law on meetings and demonstrations that didn’t include any bans. AKP was scared, and has said “no” to that as well. Today AKP talks about the protection of personal data. We have presented a legislation proposal to prevent illegal wiretappings. PM Erdoğan has blocked this attempt as well. Now I ask everybody to reckon with their conscience. Is it possible for a party that has rejected all of these proposals to be sincere on the issue of Democracy? Is it possible for such a party to claim to be democratic? Is it possible for this mindset to stand for freedom, for justice? A significant portion of what they have brought before us today is a poor replicate of our proposals. This government cannot even manage to properly replicate what the opposition has proposed. They are not up for even that much of a democratization. Today, the party that is the greatest supporter of the status quo in Turkey is the AKP. The party that is least open to change is the AKP. This is why the greatest obstacle before the progress of the Turkish democracy is the AKP itself. These were not all that we have proposed. We have been asked for more democracy, for a Turkey that is more free. We have offered Turkey not empty packages, but a vivid, colorful democracy with substance. We have announced our “Declaration for Freedom and Democracy”. This not being enough, we have brought many proposals to the Turkish Grand National Assembly. What did we ask for? We don’t want a coup d’état constitution. We want a brand new constitution, we said. The AKP has blocked the way to a new constitution with its unacceptable proposals. Each month they showed up with a new proposal about a new constitutional system. They have constantly ignited disputes. They have obstructed the making of a civilian constitution. We have said that the law on political parties must be made more democratic. We have offered to put an end to the tyranny of the party leaders, to ensure that MP’s have free will. The AKP has rejected that too. We have made legislation proposals to bring down the barricades over the freedom of opinion and speech. We have proposed to abrogate the articles in the Turkish Penal Code and in the Anti-Terror Law that hinder freedom of thought. AKP has said “no” to this proposal as well. Freedom of religion and faith… The most basic right. Can the state ever have a quarrel with an individual’s religion, with his/her conscience? Can the state ever decide what is a place of worship and what is not? We have said that cemevi’s must also be recognized as places of worship, and AKP has rejected that as well. Freedom of the press is a bleeding wound of Turkey. A press who cannot write freely, is a press taken hostage. When there’s no freedom of the press, there’s no democracy, there’s no freedom whatsoever. In a country where the press is not free, the people are blind, deaf and mute. We have introduced comprehensive proposals for developing freedom of the press. And what has the AKP done? As always, they have rejected it. We have remarked that the disgrace of imprisoned students is not befitting for this country. We have demanded that Berna, Furkan, Ferhat, Cihan and others remain in their schools and not in prisons. They have rejected this, as well. We have given proposals for the clarification of the massacre in Roboski / Uludere. All of our proposals have been rejected by the AKP. Do not imprison the will of the nation. Set free all the members of parliament elected through the will of the nation, we have said. AKP took a stance for the prison, for the jailhouse. We have made clear that the Special Authority Courts, that carry on themselves the skin of the State Security Courts, need to be completely abolished. AKP has changed the name of the court and maintained the mindset of the State Security Courts. The existence alone of these courts is sufficient to call the regime of this country “very authoritarian”. We offered to put up a commission to clarify the incidents with unknown assailants. AKP has not accepted this either. They have showed an attitude endorsing unlawful practices, murder and crime. We have proposed to abolish the Council of Higher Education and to grant autonomy to universities. We have stood up for free science, free university, free students. AKP has opposed this as well. We have proposed that mined lands be distributed to landless peasants; that instead of building a new penal institution for Diyarbakır, the Diyarbakır Prison be turned into a museum; that Nevruz be proclaimed a national holiday. AKP, the guardian of the status quo, has rejected all of these proposals. Now I want to ask Turkey. Which one is more likely to bring democracy to Turkey, our proposals or the minor package of the AKP? I would like to ask everybody, is it the opposition that is not performing its duties, or is it the government? I will go a little further: there is a government in Turkey that neglects its duties. A package that does not address the election system, the law of political parties and the internal regulations of the Assembly will not be able to democratize Turkey. No regulation that fails to ensure participation and plurality will be able to bring peace and calm to Turkey. Before us stands a package prepared by a Prime Minister who has been branded as a dictator by the World. The EU progress reports have put forth the necessary steps that Turkey needs to take for democratization. 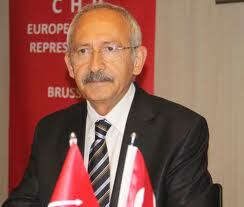 EU has criticized the anti-democratic practices in Turkey. Unfortunately, the Prime Minister has failed to respond positively to these reports. In his last visit to the US, they presented him with a book. The name of the book was: “The Psychology of the Dictator”. He failed to understand that message as well. As we have seen with this package, Mr. Prime Minister is still failing to realize the needs and expectations of Turkey. The AKP government has avoided the basic troubles of Turkey and brought up this package in order to ward off the pressure coming from the society. The package offers solutions to none of our basic problems. Advertising regulations over the usage of the letter (W), a problem which has long been surmounted in practice; or over the issue of which organization is to collect the skins of the animals during the Holiday of Sacrifice as a democratic opening out is a clear attempt to deceive the people. You need to grant freedom not to the keyboard, but to those who are using the keyboard. This is where the essential divergence between AKP understanding of democracy and CHP’s understanding of democracy lies. By changing simply the name of a university, do you solve a structural problem? Isn’t it a great injustice done to the people of our country by the Government, to present the establishment of an institute as if it is a great event, an institute which can be established within two hours by a university senate? Where else on earth can a government tell the universities that “from now on they are able to establish institutes on this or that subject”? AKP’s view that universities can take steps only upon the orders of the government reveals that AKP has no respect for academic freedom and autonomy. I want to express clearly that Turkey’s problems cannot be solved through sheer make-up. That is improvidence, frivolity, lack of seriousness. You can never solve the problems of this people with a little package that you have geared towards your own interests. Turkey needs an overall, comprehensive and extensive package for democracy. The package that Turkey needs must include all sections of society and touch all the areas of trouble. The Dictator has bestowed us with a package of democracy… He says “Democracy as much as I see fit”… It makes me think of one of the late mayors of Ankara… Infuriated by the demonstrating students, he had said, “If communism is necessary for this country and if it is beneficial, then it will be us to bring that as well. What is it to you?” Today we are facing the same mentality. The package aims to reinforce the authoritarian regime. An intellectual is a person who demands more democracy and who criticizes the government and its undemocratic behavior without fear, taking the risk of having to pay a price if necessary. Nowhere in the world is there a group of intellectuals like the one we have, trying to cover the shortcomings of the government. What have the media branches and intellectuals who, until recently, were unable to enter certain institutions because of the issue of accreditation, done for those who are being subjected to the same treatment today? I would like to ask those who put the Government on a pedestal, use show every means to praise the Government…The Council of Higher Education is standing intact. Why don’t you criticize the Government? The Court of Accounts, the essential institution of modern democracy, has been practically abolished. Why are you silent about it? How democratic an attitude is it to criticize the opposition party day after day, from the column of a newspaper seized by the Government? Currently, Turkey is being administered by what is practically the most centralized administration it has ever seen. Why don’t you criticize that? We express that we are behind our 17-article declaration for freedom and democracy. The Republican People’s Party shall stand firmly for all the steps taken in this direction. As the party who has introduced the multi-party regime into this country, the CHP has said “yes” to all the reforms to democratize the country, and shall continue to do so… We shall struggle until the end for a real democracy.